Weekend waffles with maca, an anti-inflammatory, antioxidant that can be likened to natural Viagra as it helps potency in men. Breakfast granola with lucuma, a tangy tropical fruit that helps balance high blood pressure. Savory white bean hummus made with sacha inchi, a powerful omega-3s for heart health and brain power. Muffins made with pichuberry, a glucose controller, sugar regulator, and accelerant for flushing fat around the middle. Sinful yet slimmed-down brownies with cacao, an amazing antioxidant and chocolate substitute in everything from smoothies to cakes. From Peru to your plate, this Amazon-inspired health makeover will allow you to enjoy optimal health and optimal flavor one meal at a time. This book is a labor of love. Love of health, food, country, and travel. When we first began working together, building Manuel's brand for his weight-loss program, Eating Free, we could not have imagined that five years later, we'd be traveling to Peru and scouring remote mountain and jungle locales to learn more about the most powerful foods on the planet. But for Manuel—a registered dietitian and native Peruvian—and me, a writer drawn to food and travel—it was a dream project as well as a timely one. For much of Manuel's career, he's focused on helping people embrace food, while teaching them how to lose weight safely and sensibly. Sadly, the American obesity epidemic keeps growing, and with it we see growing rates of diabetes, cancer, and heart disease. While health-conscious people used to focus primarily on how much to eat solely for weight maintenance, today we see an equally prevalent concern about which ingredients to eat for optimum health and disease-fighting potential. It's no longer enough to control calories or shrink portions when thinking about being totally healthy. To combat the effects of a toxic world, we must consider the quality and purity of what we're eating as well. This mind-set is bringing with it a paradigm shift away from quick and convenient foods and back toward the farmers' markets, organic food, and, of course, power foods. 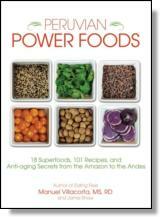 We define power foods as hardworking functional foods that far surpass basic nutritional content. They are, quite simply, the cleanest, most powerful, antioxidant-rich, anti-aging foods available anywhere. While these ingredients have been staple foods for centuries in South America—particularly Peru—many of these foods are only newly available in the United States and elsewhere. Our goal is to introduce some of the most readily available choices, to reveal their nutritional and health benefits, and to share recipes that make it easy and enjoyable to integrate these amazing foods into your everyday diet. -strengthening ingredients that contribute to overall vitality and a long life. Because these foods have long been hidden deep in Amazonian jungles and Andinian valleys, we are only beginning to understand their profound health benefits. What we can unequivocally say is that they are proving to surpass even the wildest expectations of their potential healing properties. Many of the foods you'll learn about in this book have superlative health benefits, beating all other foods in their class with remarkable nutrient density. For example, the pichuberry is emerging as one of the most concentrated antioxidant fruits known to man. It has a remarkably low glycemic index (GI) of 25 (compared to a GI of 50 for blueberries and 53 for the pomegranate), so it's both a diabetic- and weight-loss-friendly fruit. Another superstar power food is sacha inchi oil, which packs the highest level of omega-3 fatty acids in any plant. By volume, sacha inchi has over 48 percent omega-3s—that's over 84 percent total fatty acids—so it's one of the most powerful inflammation fighters ever discovered. A third power food we'll introduce is camu camu, which is bursting with vitamin C (just one teaspoon can provide 1,180 percent of your daily vitamin C needs!). So as you can see, power foods aren't just a feel-good phenomenon. They are actually proving to be the most potent sources of dietary nutrition available to us. And while many people are already aware of this class of foods—perhaps from seeing them pop up in grocery stores or juice bars—most are still unsure about exactly what they are, what they do, and how to use them. That's why we set out on an adventure to discover the origins of and best uses for these incredibly potent foods. We mapped a travel itinerary that would take us from the culinary capital of Lima, with its fresh seafood and criollo or traditional creations, to the rich farmlands of the Andes where over 3,000 kinds of potatoes and 200 species of corn are grown, to the depths of the Amazonian jungle, where thousands of potent fruits, nuts, and seeds originate. Of course, Manuel came armed with all the latest scientific research about the properties of these ingredients, but we were also after the stories of these foods—where they come from, how they're prepared, and how the locals practice a farm-to-table approach. Our travels led us to open markets, restaurants, farms, home kitchens, and thatched jungle huts where we spoke to chefs, fishermen, farmers, abuelitas, aunties, food bloggers, and pretty much anyone else along the way who had a tale, some history, a recipe, or a recommendation about these foods. While we toured open markets in each area we visited, our experience culminated at the Belen Market in Iquitos, a bustling town on the river in the Amazonian jungle. Like the great markets of India, the souks of Morocco, and the now-demolished stalls of Les Halles, the Belen Market is a city unto itself. Thousands of stalls deep, the marketplace is a destination for anything and everything, from exotic fruits and seeds to still-flapping piranhas and freshly poached monkey meat; from rattlesnakes and medicinal herbs from the local witchdoctor, to clothes and pills and flyswatters. Belen is a microcosm of the greater city, with whole families sitting together selling wares, babies sleeping next to butchers plucking chickens, and rats scurrying under tables stacked high with pastries and plastic toys. Belen is, at once, third-world poverty and an explosion of Amazonian abundance. The sheer amount of natural resources is staggering, and in some ways, it represents the rich offering of Peru at large. Here, we discovered foods we'd never seen, heard of, or tasted before—an indication of the still unknown resources and riches of this bountiful nation. Part of the reason Peru is such a culinary hot spot is because its cuisine is an incredible fusion of local abundance and global flavor, from Mediterranean to Asian influences. Peru also boasts three distinct microclimates. The rich topography spans the pristine coast, the fertile mountains and lush valleys, as well as the dense jungle rainforest. Our goal in covering all this ground was to familiarize you with some of these exciting new foods (all of which are newly available in the United States) and encourage you to add as many of them as you're able to your regular diet. You'll gain the greatest benefit by mixing and matching these foods and eating them with regularity. In fact, be on the lookout for our 'powerstar' recipes—dishes that incorporate two or more power foods for the greatest health benefits in any one dish. It is, after all, the combination of all these nutrients and foods—not any one ingredient—that will offer you the optimal health benefit. Have fun and experiment, using these recipes as inspirational starting points. The dishes we've included range from the very simplest grab-and-go energy items, like smoothies, power bars, and raw truffles, to simple salads, side dishes, hearty entrees, and baked goods. We've even created coffee drinks and cocktails to round it all out. Don't worry about precision or perfection. Have fun experimenting by trying these ingredients in your everyday favorites like smoothies, salads, and desserts. Once you do, incorporating these items will be easy and effortless—not to mention hugely beneficial to your health. We hope you enjoy reading this book as much as we enjoyed writing it. Salud! ©2014. MANUEL VILLACORTA, MS, RD and JAMIE SHAW. All rights reserved. Reprinted from Peruvian Power Foods. No part of this publication may be reproduced, stored in a retrieval system or transmitted in any form or by any means, without the written permission of the publisher. Publisher: Health Communications, Inc., 3201 SW 15th Street, Deerfield Beach, FL 33442. Jamie Shaw is a writer and brand expert. Whether she's reviewing restaurants, blogging about food, leading cooking lessons or consulting on a global line of raw fruit, vegetable and nut juices, this avid gourmand is passionate about merging her two great loves: writing and cooking. Jamie holds an MFA in poetry from San Francisco State University.